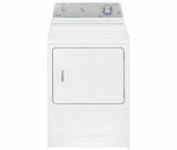 The Maytag Legacy Series drier is a easy drier to use. There are three basic settings. Times dry with extended tumble, regular dry with fluff dry cycle, and a delicate setting. You can turn the buzzer warning on and off. It buzzes as it changes from regular dry to the extended tumble then when the extended tumble is almost over. The lint trap is easy to clean and seems to do a good job. It was easy to install, just plug it in and hook up the vent tube. Ours is basic white with a silver control panel up top but it matches the washer. The door is reversible to match however you set things up. It opens to the side and the top is clear making a nice work area to fold clothes or set your soap and drier sheets. I often make a mess on it and it has been easy to clean up on the outside as well. It has been durable as it shares space in a play area in my home. It is fairly large but you can put a lot in to it to dry and it handles it well. So great for a family with lots of laundry.